Edith Wharton (1862–1937) was a Pulitzer Prize-winning American novelist, short story writer, and designer. The CENTRAL SF CLASSIC LIT BOOK CLUB will discuss The Age of Innocence by Edith Wharton. This month we will be meeting to talk about House of Mirth by Edith Wharton. 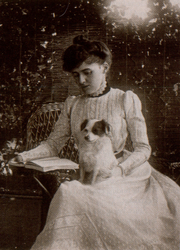 Edith Wharton was born Edith Newbold Jones to a wealthy New York family. She spent her early childhood in Europe, where she developed a gift for languages and a deep appreciation for art, architecture and literature. She was educated by governesses and by her own reading, and began writing at any early age. Verses, her first volume of poems, was published privately when she was 16. In 1885, she married Edward "Teddy" Wharton, 12 years her senior. In 1897, with Ogden Codman, Jr., an architect friend, she published her first major book, The Decoration of Houses (1897). A few years later, she bought 113-acres in Lenox, Massachusetts, then designed and built The Mount, a country home to meet her needs as a designer, gardener, hostess, and writer. During the next 10 years at The Mount, she wrote some of her greatest works, including The House of Mirth (1905) and Ethan Frome (1911). After a divorce from Teddy Wharton in 1913, she moved permanently to France. During World War I, she did social reform and humanitarian work, including establishing schools for refugee children, for which she received the Legion of Honor. She continued to write prolifically, producing more than 40 books in her career, travel, and garden. Today she is considered the supreme lens through which we view the social ambitions of the rich and newly rich of the American Gilded Age. Edith Wharton's book Enter at Your Own Risk: Fires and Phantoms was available from LibraryThing Early Reviewers. Edith Wharton's book Fighting France: From Dunkerque to Belfort was available from LibraryThing Early Reviewers. Edith Wharton is currently considered a "single author." If one or more works are by a distinct, homonymous authors, go ahead and split the author. Edith Wharton is composed of 20 names. You can examine and separate out names.